Pope Benedict XVI addresses faithful for the last time upon arrival in Castel Gandolfo, Italy, on February 28. Editor's note: Sebastian Gomes, a producer at Salt and Light Catholic Media Foundation in Canada, was an accredited observer to the Vatican Synod of Bishops in October. He is acting as an assistant to the Rev. Thomas Rosica, a spokesman for the Holy See during the papal transition. 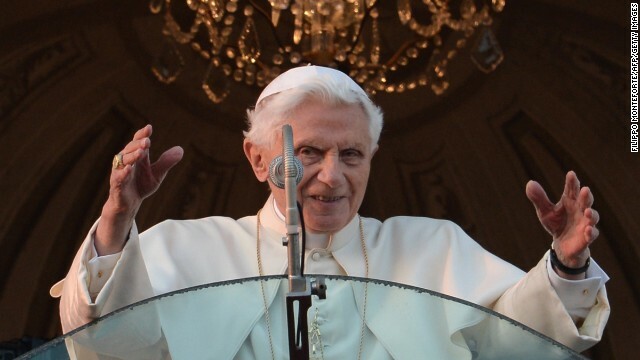 (CNN) - Pope Benedict XVI shocked the world by resigning last month, but before leaving the throne of St. Peter vacant, he seems to have spent months, if not years, charting a course for the future of the Catholic Church. In hindsight we see how calculated Benedict’s thinking was, and not only about his resignation. He called an unexpected consistory to be held on November 24 in which he created six new cardinals, none of them coming from Europe. That came nine months after the previous consistory, meaning that in the last year of his papacy, Benedict appointed 24 of the 115 men who will elect his successor. But he did more than just create new cardinals - he provided one final opportunity for them to come together and discuss the future of the church. A month earlier, the Synod of Bishops on the New Evangelization for the Transmission of the Christian Faith was convened in Rome. A synod brings a sampling of the world’s bishops together to discuss a particular theme, in this case evangelizing those who have drifted away from the Catholic faith, especially in the Western world. This synod - the last under Benedict - took a long and in-depth look at how the church can effectively present the person of Jesus to the contemporary world. It ran from October 7 to 28 inside the Synod Hall at the Vatican, where the cardinals held their pre-conclave meetings. The participants included 262 bishops, 56 cardinals, 91 experts and delegates (30 of whom were women - the most ever at a synod). If we presume that Benedict had a "master plan," we can be sure that this synod was part of it. What I have discovered in these days before the conclave is that many of the issues being raised here are the same issues that were raised at the synod. In other words, if you want to know what the cardinals are discussing in the general congregations, look at what they discussed in October. Like the general congregations, the synod sessions are always closed to the public and the media for practical reasons: Bishops speak openly about political and religious persecution in parts of the world, for example. But for the first time in history the Vatican allowed two young Catholic journalists inside to help tell the story. I was one of those journalists. I remember the first week of the synod when voices of bishops from around the Western world were raised: “Europe needs to be evangelized!” Then came the critical analysis of the ever-growing secularism in the West, and the corresponding lament for “the good ‘ol days” when Catholics went to Mass on Sundays and didn’t question the hierarchy. But soon the conversation shifted, and we began to hear a different, more modest tone. What happened, I think, was that the bishops began to reflect on their own words and actions, and to ask how they - the hierarchy of the church - have contributed to the crisis of faith in the West. They began to speak about humility. Most people when they think about the church do not think about humility. The more common perception is that the church is monarchical, condescending, judgmental and controlling. But it was clear to me after about one week inside the Synod Hall that humility was the new starting point for talking about the future of the church. While I do not think Benedict could have predicted this development, I think he understood the importance of these men spending time together only a few months before his resignation. People who have participated in a synod will always tell you that it’s more about the experience than the result. What we would call the critical issues in the church today: secularism, consumerism, indifference, persecution, Islam, governance, catechesis, and parish and family life were discussed, but always in this atmosphere of self-reflective humility. It was a shift, albeit unexpected, that suggests a longing for a new approach going forward. Assuming Benedict called the synod with his resignation in mind, it is likely that he ensured the strongest candidates to replace him were present. And so whoever becomes pope, there is a good chance he influenced the synod and the church hierarchy’s current thinking about itself and the world. Perhaps more importantly, the experience of the synod influenced him, too.